It’s time to reveal the second character portrait from The Celestial Isles #1, The Electrical Menagerie! If you missed the reveal of Sylvester Carthage, you can see that here (opens in a new tab). Plus, keep scrolling after the artwork to read a bonus story! Raised in the lap of luxury on far-off Fallsbright, Huxley’s self-imposed exile to the mainlands hasn’t been easy. On a quest to find himself and make his own fortune, Huxley’s continual coming-of-age has taken him from heir, to bank clerk, to Sixes dealer, and now to producer and manager of the Electrical Menagerie. Possessing a tongue silvery as the derringer up his sleeve, Huxley is equally talented at both solving problems and causing them. Ya’ll. 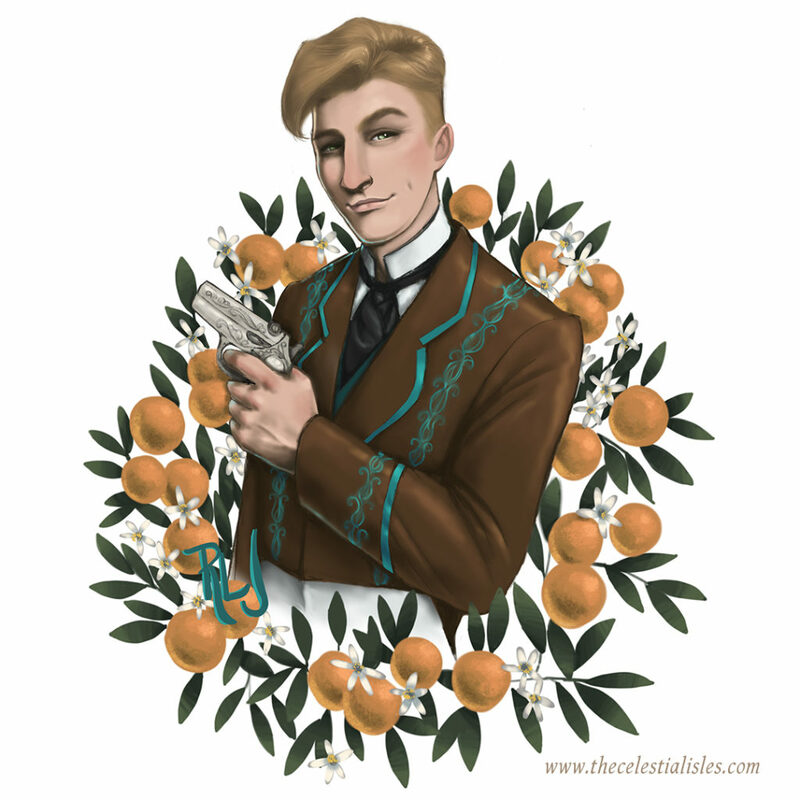 😍 When I commissioned Randi, I had so much fun writing the creative briefs for all these characters, but probably my favorite line in any of them was “Huxley’s aesthetic is riverboat gambler meets Disney Prince.” I SO enjoy seeing Randi capture the characters the way they come to life for her, and I absolutely love that Huxley Smile™. Remember to follow Randi on instagram if you aren’t already! After last week’s glimpse into Carthage’s backstory, I wanted to give you guys a glimpse into Huxley’s, too — and the story that emerged wasn’t exactly what I expected it would be. Enjoy! Arbrook Huxley stood on the platform, wringing his fingers behind his back, as the train steward looped a tag through the buttonhole of his coat that said UNACCOMPANIED MINOR. The steward was a very old man with wiry gray hair and a faded blue cap. Brook had yet to see him smile. The First Class coach was occupied by a handful of gentlemen and two old, fancy-looking ladies who gave Brook sugary smiles as he went past. The steward seated him near the back and by himself. Crossing his arms, Brook scowled into the air. He wasn’t accustomed to being treated like a child. He was twelve now, and his parents expected independence, as evidenced by that tag looped through his buttonhole. They had seen him to the depot and no further. They even trusted him with two whole dollars. Outside, Queens Junction rolled away and swiftly turned to bush. Brook folded down the little table under the window to play cards, but found the air too stifling to relax. He tested the latch on his window, but a warning look from the steward kept him from opening it. When the steward left the coach, a man emerged from the lavatory. He was thickset and dark-haired, with a mustache and a patterned waistcoat, but no coat. As a different steward rolled a brass cart down the aisle, offering passengers tea and cakes, the stranger squeezed past, pocketing a seed cake as he went. His gray eyes roamed the coach, and they settled on Brook. Brook stared unabashedly as the stranger sat down across from him. This man — who didn’t even have a coat! — surely didn’t belong in First Class. What would happen if he was caught? Probably more than a smack on the hand. The man turned the latch on the window, letting it ajar so that fresh air brightened the space. Then he took the stolen cake out of his pocket and stared out the window as he ate it. It wasn’t until he had licked his fingertips and brushed the crumbs off the knees of his trousers that he said anything at all. “Where are you going by yourself?” he asked. Something rose up out of Brook’s chest, almost too sudden to restrain. He barely swallowed it. “I don’t know,” he said. Brook played his father for money sometimes, too. Pennies, anyway, even though mother disapproved. But he didn’t have any pennies — just those sterling dollars down in his pocket. Brook fished out one of the sterlings. It chimed as he clapped it on the table between them, Alexander II’s silver brow furrowed as if displeased by his inclusion in this wager. Sam produced a downright impressive wad of banknotes, and Brook reconsidered his assumption that Sam didn’t belong in First Class. Peeling off a pink-and-white dollar, Sam then left its swan sitting face-up next to Alexander. Brook was the undisputed household champion of cogs. There was distinct strategy to deciding when and where to play the hexagonal cards so that they formed an interlocking chain of matching edges, like gears in a machine. He was very good at anticipating what was left in the draw pile and planning several steps ahead. It turned out Sam was very good at that, too. Better, maybe, than Brook. But Sam was sitting lazy and crooked in the corner where his seat met the wall. The window was tilted half-open, angled to perfectly capture a reflection of his cards. They were backwards, of course, but Brook could read almost all the edges — and it was not his fault that the glass was so revealing. “Two dollars?” Sam whistled as he played his next card. “Where are you going to?” Brook asked, still thinking about all that money Sam had in his pocket. Brook couldn’t see Sam’s cards anymore, but he remembered them all — he was sure he did. Except that Sam then began playing cards Brook didn’t remember him having. Staring helplessly at his own waning hand, his heart sank into his belly. Maybe it would come to a draw. It did not come to a draw. Sam won handily. “You— ” started Brook, panic flushing him. But there was no way to accuse Sam of cheating without outing himself. Before Brook could reply, Sam was in the aisle. The whistle blew again as he vanished into the next car, and Brook didn’t see him again. Halpertsdown was a smallish, sensible town, and the warm air stuck to Brook like molasses. He was still thinking about Sam as he disembarked onto the open platform. Emotions mingled, unpleasantly. Loss, and anger — at Sam, but even more so at himself — loneliness, a little bit of confusion, a strange hint of admiration, and hunger. Which was not an emotion, exactly, but it felt like one. Having lost his lunch money, he’d be going hungry until the school collected him around dinnertime. The clap of a gun shattered the lazy afternoon. Brook jolted, grasping the closest handrail of the train. He had been out on hunts since he was old enough to walk, and he even had his own rifle at home — but something about this lone gunshot sent a lick of cold racing down his sun-warmed back. It seemed to echo, like a thunderbolt, and only silence followed. People picked themselves up from where they had instinctively ducked, and then there were a few moments of clamor. No more gunshots came. Minutes passed, and the crowd on the platform dispersed, but Brook remained clinging to that rail. He felt in that moment very minor, and he didn’t want to be unaccompanied anymore. Suddenly, he wished someone would come along and treat him like a child. “Boy,” called a familiar voice. Relief flooded Brook, and he went willingly. He waited at the station until five-thirty. He tried to be quiet, and didn’t fuss with anything. The steward fed him half a pie out of his own pail. He wondered about that man the posse shot. He would still think about Sam, years later, again on sleepless nights, and at odd hours, and when his memory was curiously jogged by the smell of commercial trains, or by somebody eating seed cake. But in the end, after lunch, he put that business with the posse, and the stranger who took a bullet in Halpertsdown, out of his mind. He didn’t believe it was Sam who robbed that bank and shot up those tellers. He didn’t believe there was a gun hidden up against Sam’s belly the whole time they played cards. And he didn’t believe that Sam died that day. Even though Sam had taken his money — and his trust, and a little bit of his pride — he chose to think that Sam was living somewhere, that elusive someplace better he was traveling to. In the end, Arbrook Huxley preferred to believe the cheater got away. What did you think of the story? Are you excited to learn more about Huxley in The Electrical Menagerie? Comment below and tell me what you’re most looking forward to! 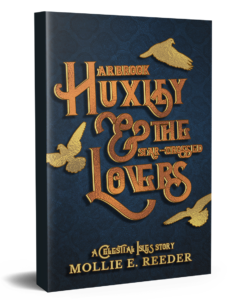 Remember, email subscribers get a free book, Arbrook Huxley & the Star-Crossed Lovers — a comedic Celestial Isles novelette featuring Huxley, an important luncheon, a disapproving aunt, and a VERY unfortunate mix-up with a magician’s hat. Click to claim your copy!